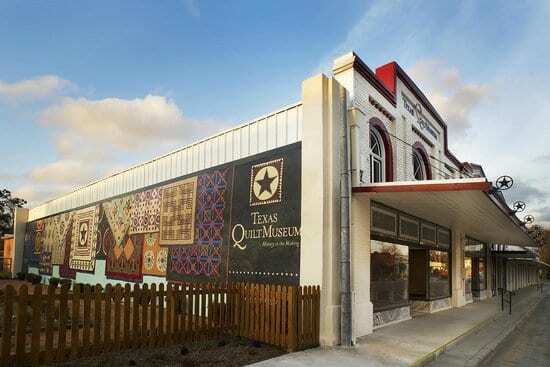 Located in the heart of La Grange’s historic district, the Texas Quilt Museum features stunning exhibits of antique and contemporary quilt art from around the world. These exhibits—which change four times throughout the year—showcase the very best of all genres of quiltmaking in three different galleries, offering a total of 10,000 square feet of exhibit space. From works by unknown makers of the 19th century to today’s top needle artists, visitors can view amazing creations featuring a variety of techniques and styles. While their original use was more for warmth and utility, most quilts of today are created to be displayed as art. And the Texas Quilt Museum, the only quilt museum in the heart of the country, makes a perfect venue for visitors to explore the rich history and ongoing evolution of that art. Housed in two award-winning restored 1890s buildings, the Museum complex includes an outdoor period garden oriented toward a huge quilt mural, the Pearce Memorial Library and Material Culture Study Center, and space for lectures and gallery talks, as well as the Museum store. Whether you’re an avid quilter or an appreciator of art, the Texas Quilt Museum offers you an intimate look at of one of America’s best-known, and most treasured, art forms. Visit www.texasquiltmuseum.org for more information.